Facebook Insights: Do You Like Your Results? Facebook (hereafter referred to as FB) does a great job of keeping people informed about the exciting and mundane things people in your social hub do. It does a terrible job of explaining ANYTHING in its help section, including how to understand the what, why and how behind some of their newly baked metrics in Page Insights. We’ve taken what FB says about their numbers and boiled it down to what you REALLY need to know to see if your FB work is doing you any good. Because after all, that’s really what it’s all about. If FBing isn’t contributing to your business goals, do you really want to be spending time on it? There’s two ways to get to them: One way is through the Admin Panel above your Timeline. If you don’t see this, look for the Admin Panel button. The other way is by accessing them in them in the drop down menu near the Like Button. Starting with the Overview, we’re going to cover the highest level metrics and leave deeper ones for another article (you’re welcome.) 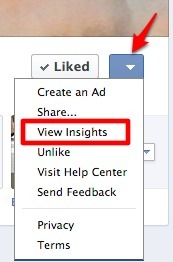 So load up your Insights and the first thing you will see is an Overview of your FB metrics. Defined as all the people who have clicked on the thumbs up Like button either on your page or off of your website (if you have the Like Button installed). Note that these are the people who like you as a total entity. This does not include people who only liked a piece of content on your site. Likes for content, like a blog post, is a different metric, one that is, as far as I can tell, not displayed by FB insights (although I am sure it plays some role in their calculations of how awesome you are (or not). Defined as the number of people you can POTENTIALLY reach if everyone you are connected to talks about your page to their friends, which of course in reality would never happen. Use this metric to see if those people who liked you have some social cred. The more friends your fans have the more this number should go up. Does this number include the friends of friends? No, and for some experts it’s more a “vanity metric,” meaning it means nothing. But then IMHO, the number of friends can be seen as a vanity metric. It all depends on what INSIGHTS you gleam from the metric. Here’s our take: Don’t put too much stock in the actual number; put stock in its percentage increase compared to the number of likes and always look at it for your potential audience size. Look to it for answers to questions like: “Is my potential audience growing bigger? Am I catching any big fish (those with lots of friends who likely share a lot)?” If this number drops you may have lost some of those big fish because you were over-sharing or sharing boring stuff or heaven forbid, over-sharing boring stuff. Some experts think this metric is meaningless because there are so many types of actions included, and you may be getting a lot of action but actions, nonetheless that are meaningless to your business goals. Well, let the big brands with thousands and thousands of followers worry about that. If you are just starting off or have a Page that is just not going to attract that type of volume, watching this metric can still give you some confidence as to whether people are caring and sharing. That’s what you want to see. The top three items in the list will always be the Holy Grail for most businesses, but hey, you have to start somewhere. Defined as the number of unique people who have seen your message displayed…regardless if they are a fan, friend of fan or from another planet. It counts all of it. However, no matter how smart FB is, I am not sure that even it can be 100% positive that a person ACTUALLY saw your message. It may have been there for them to see but whether they noticed it or not is really anyone’s guess. So again, as with most metrics this a guideline number, not an absolute. There used to be something called “impressions” which differed than reach but that seems to have disappeared in the FB Insight changes. Look for spikes in this and then try to trace it back to something specific you did in the preceding week. This is the best number to see if the content you have posted is getting out beyond your limited network. Hopefully, when there are spikes in Reach, you get more Likes. I bet you are feeling more insightful already, right? Okay, now travel down the page to data at the Page Posts level. At the Page Post level…. Defined as the number of unique people who have seen your post whether fan, friend of fan or foe. At a first glance it can definitely give you an idea of what has the most traction, and since it doesn’t just include the people who liked your page, you know that there is some sharing with friends involved. Sharing is good. This is a subset of Engaged Users, focusing only on stories generated and leaving out all the rest of the items the Engaged User metric counts. Talking About This is probably a better metric for most people to look at it instead of Engaged Users as it gives you a better indication of how shareable your content is or how comment worthy it is deemed. This is important if you’re using Facebook to build up a community in its own right and aren’t just posting links to drive traffic to your site. This is how you might use the two metrics in reality: Say you see a number under Engaged users and nada for the same post under Talking About This. This means people were kind enough to follow the link in your post, but not kind enough to share it with their friends. Hmm, what does that tell you? Maybe that when they got to the other side of the link they weren’t impressed enough to share? Or perhaps they did share it, just not within the confines of FB. Maybe they shared it with their LinkedIn colleagues. The point is that FB metrics, just like website metrics such as you can get using Google analtyics, don’t exist in vacuums. You have to know what you are going after, what questions need to be answered to know if you are getting closer or farther away from your goal and which metrics give you the best chance of answering those questions. That takes thought and you have to do it, or hire a super cool firm such as Juicy Results to do it for you. Sorry for the shameless plug. Okay one last metric and class will be out.. Most men will claim they have it until they realize that’s an “a” after the “r”, not an “i.” Although, having this new made up term associated with one’s personal brand may not be such a bad thing. This metric basically shows you of all the people who saw this piece of content, how many percentage-wise actually talked about it. Think of it as the percentage version of the Talking About This metric. Besides the Overview tab, there are several other tabs you’ll want to know about: Likes, Reach, Talking About This and Check-ins. Read about these in part two on Facebook Insights. If you liked this post why not share? Or if you’re not in a sharing mood, sign up for our RSS feed and get this kind of info hot off the press.